If you can answer yes to this, your marriage may be on dangerous ground. Ground that will crumble beneath you. You may have built your relationship on sand instead of a sturdy foundation. You may have built your marriage on a feeling instead of a commitment. Your happiness needs to be grounded in a real foundation. God tells that if we follow what’s in His Word, we inherit a book of living, the perfect gift, one that makes you happy. The foundation of happiness if found in the Word. Within God. He’s the only one that can supply you with happiness if you are willing to follow His instruction and inherit His Book of living. 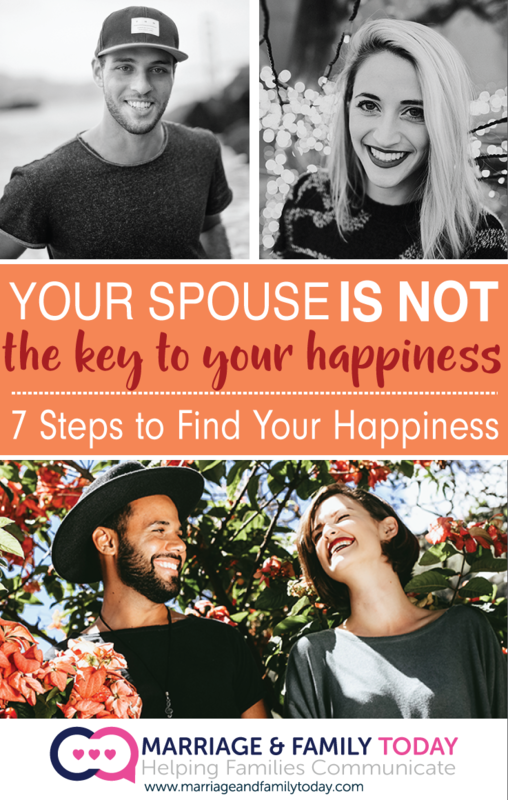 If you are seeking your happiness in your spouse, at some point you are going to have to release them from that responsibility and seek your happiness in the only place that it can come from. When you become stable in your source of happiness and realize that you are responsible for yourself, then you can move on to the next step of your relationship and find true love between each other. Release Your Spouse. Release him or her from being the one to make you happy. Find your true source of happiness. Ask God for Guidance. The guidance and direction you need to find the happiness you seek can only come from God. He is the source of true joy and happiness. Study the Word. Find what it says on joy, peace and love. If you need to, Google “joy scriptures” – “peace scriptures” – “love scriptures” to help you begin the search in your Bible on happiness. Notice the Good. Count the good things in your life, your blessings. We often overlook the good stuff when we are feeling down. I willing to bet there is at least one good thing in your life. Once you begin to actively seek what is good, you will find more. Be Happy For Each Other. Instead of trying to find happiness within each other, be happy for each other. Be excited and proud of each other’s accomplishments, no matter how big or small. Dream Again and With Each Other. Did you forget about dreaming together like you did when you were engaged? Dream again. Find happiness together. Serve Your Spouse and Others. When we take our eyes off of ourselves and focus on others we lessen the down feelings we have. Serve your spouse, do for him or her what you wish they would do for you. I believe that our purpose isn’t to necessarily seek happiness, but instead, it’s a result of seeking God and following his instruction on living a great life. A life that He wants for you. When we do that, then happiness comes. When we are following what we are supposed to do, then we are content and feel safe. Just like a child or a teen, when they are not following their parent’s rules and instructions, they don’t feel at peace. They may feel that they are having fun and living their own life, but peace doesn’t usually happen.